Aloy Modern Thai opened in 2016 to bring the slow-cooked, farm-to-table experience found in Bangkok’s finest restaurants to Denver’s LoDo. Two continents and many years in the making, Aloy Modern Thai is the culmination of sisters Bo Bean and Arisa Chanchokpong’s dream. Growing up on a small-farm outside of Bangkok, the sisters immigrated to the United States in 2006 to help their mother, Kim, open the award-winning Aloy Thai in Boulder. 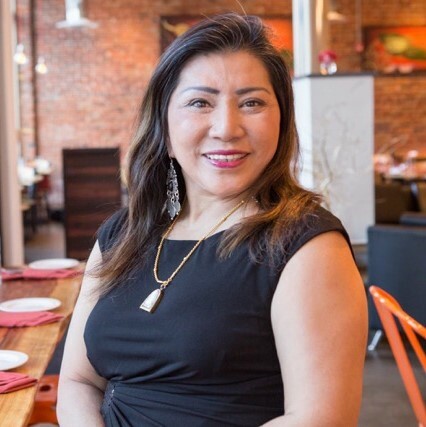 After a decade of experience serving traditional Thai dishes, it was a passion for sustainability and the evolution of modern Thai cuisine that led the sisters to open Aloy Modern Thai in Denver. Their unique concept brought together some of Bangkok’s best chefs to create an upscale but casual restaurant that marries today’s contemporary Thai dishes to local meats and produce through healthy, slow-cooked, farm-to-table meals. 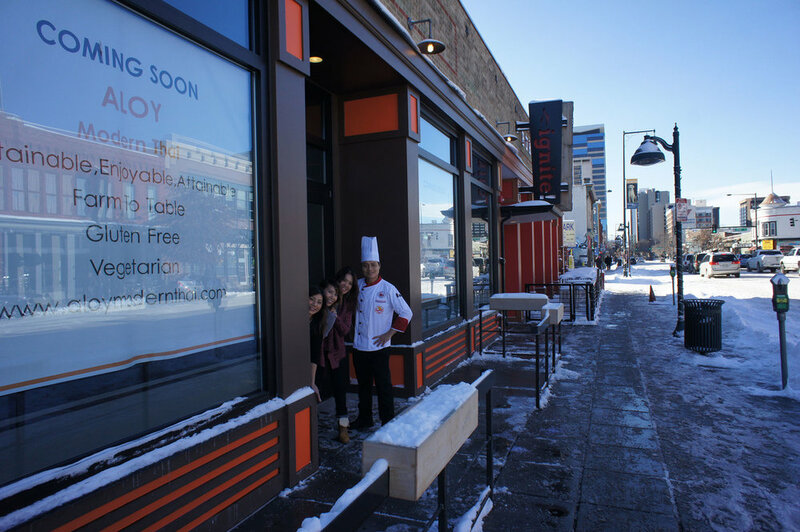 Now, that the concept is realized, Arisa, Bo and their team are proud to bring the playful elegance of Aloy Modern Thai to their guests and all of Denver. Thai cuisine has come a long way since Pad Thai was made the national dish in the 1930’s. Contemporary Bangkok chefs, like those who have helped shape our menu and dishes, are influenced by a hosts of cultural trends, often working closely with subtle complimentary and contrasting flavors to bring out the authenticity of the ingredients. In creating the Aloy Modern Thai concept, it was important for us that we showed the evolution and accessible sophistication of modern Thai cooking in our menu. From seafood, to Kobe beef, to Colorado lamb and local vegetarian fair, our dishes represent the best of Bangkok’s cosmopolitan treats– with, of course, or own bit of flare. We work closely with local farmers and ranchers as well as community-based food advocates to bring sustainable, humane, and healthy choices to Denver diners. With a seasonal menu of slow-cooked foods that are as good for the earth as they are for those eating them, we focus on bringing health and happiness to our guests, employees and community. In addition to our sustainable operations, we believe in helping sustain a community through supporting groups like Colorado Les Dames D’Escoffier’s scholarship program, Slow Food Denver’s school Seed to Table Program, and many others. In keeping with our beliefs, we hold Community Night ever Monday where 20% of $30 three-course meals are given to the charity of the month. We invite you to attend. 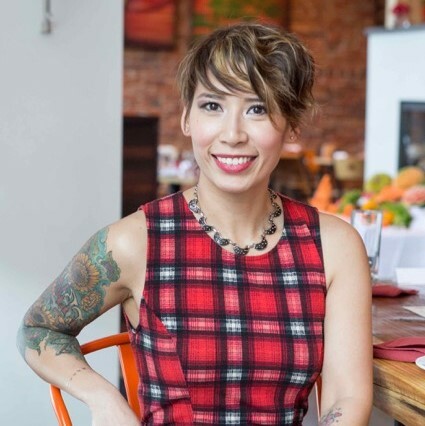 Sister Bo Bean and Arisa Chanchokpong first found their passion for sustainable, farm-to-table cooking growing up on a small farm just outside of Bangkok. That passion only continued to grow as they saw it infused into some of the most famous restaurants in Thailand. Immigrating from Thailand in 2006 with their mother, Kim, Bo and Arisa helped her open Aloy Thai in Boulder. Using Kim’s traditional family recipes the restaurant quickly garnered accolades and customers. Now, after 10 years of serving up award winning traditional dishes to Boulder, the sisters have paired their passion for today’s slow-cooked Thai cuisine with local farm-to-table foods to bring Aloy Modern Thai to the heart of Denver’s Ballpark District. At the heart of any kitchen are the people who run it. We believe strongly that the energy you put into the world is what you get back. We have a passion for food, for sustainability, for creating a place where people are happy to come work and dine and we work with our employees to create a full customer experience, but we also work to provide a great work environment. With many of our employees coming from Thailand, we become a close knit community that helps each other reach our goals both in the workplace and out. We believe that when people are happy coming to work, this in turn can be felt in the atmosphere and quality of food.